The 100 Cigar Glasstop Humidor will showcase, humidify and age as many as 4 boxes of fine cigars. Features attractive rosewood finish, gold plated lock and key with tassel and hidden quadrant hinges. 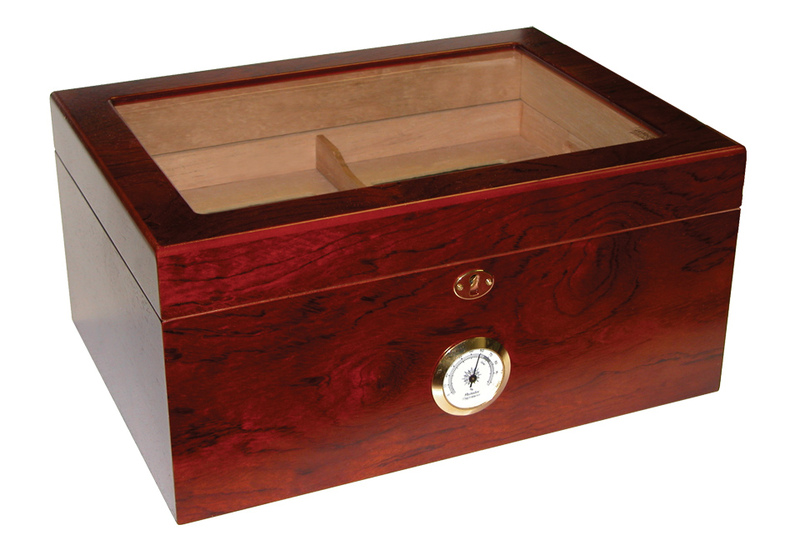 Glass hygrometer with brass ring makes it easy to check the humidity level inside the humidor. Engraveable brass nameplate. Tempered beveled glass lid features SureSeal technology to insure a proper seal. Lined with premium kiln dried Spanish cedar, with a Spanish cedar tray and divider and two dividers for the bottom compartment. 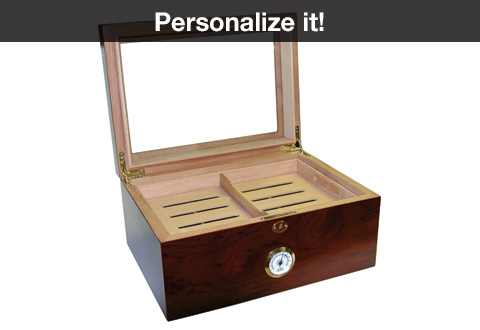 Humidifier adds or subtracts moisture from the air to keep your cigars in ideal 68% to 72% humidity. The 100 Cigar Glasstop Humidor is a large capacity humidor designed to protect and age up to 100 of your favorite smokes cigars. Beveled tempered glass top provides an ideal view of your cigar collection. Divided Spanish cedar tray, plus 2 dividers for the bottom compartment. Scratch resistant felt lined bottom.